If you are 35 or older, you have had at least one moment when you cannot remember something you know well. At first, we laugh it off as a signal that we are just lacking a little sleep or we are too busy. But not having enough sleep, running on cortisone and adrenalin to meet several deadlines a day, being too busy to exercise or eat well is actually damaging that precious brain of yours. We are all a little scared of Alzheimer’s and we have good reason to be scared. Although only 1% of people under 60 are affected by this horrible disease, it hits 10% of people between 65 and 74, 33% of those between 75 and 84 and 50% of those over 85. How old will you be in 30 years? There is good research now that indicates that we can delay or prevent the start of Alzheimer’s even if it is in your family genes. 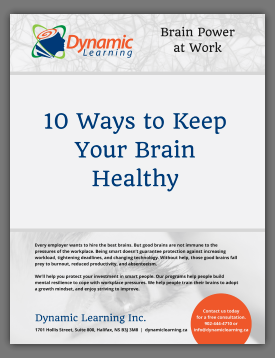 But the sooner you start deliberately taking care of your brain, the better for you. If you are intent on keeping your brain healthy, start by making sure you are getting some aerobic exercise every day as this is the best and fastest way to slow the aging process. Then work to minimize your stress, and arrange to get at least seven hours sleep most nights. Even though you may be using well-developed knowledge, skills, and experience at work, you need to continue learning something new and challenging for the rest of your life. Eat a well-balanced diet of food that is good for your brain and your body and enjoy an active social life. The most valuable, powerful, fragile item you will ever own is your brain. If you take good care of it, it will reward you with a happy life.